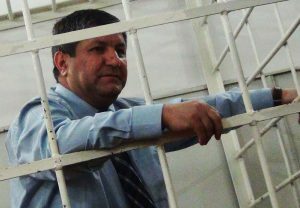 The Institute for Reporters’ Freedom and Safety (IRFS) is alarmed by reports of the deteriorating health of Khural newspaper chief editor Avaz Zeynalli who is currently serving a pre-trial detention. IRFS considers Zeynalli to be detained in violation of Article 19 of the International Covenant on Civil and Political Rights and Article 10 of the European Convention on Human Rights (ECHR) to which Azerbaijan is a party, and calls for his immediate and unconditional release. Pending his release, IRFS urges that Zeynalli is given all necessary medical attention as a matter of priority. According to journalist’s spouse Malahat Zeynalli, he suffers heart pains, severe headaches and hypertension, has breathing problems, and has also developed some symptoms of diabetes. “On February 21, Avaz appealed to the chief of the Baku Investigation Prison (where he is being held), Azer Seyidov, and asked to move him to the medical section of the prison and provide medical treatment”, Malahat Zeynalli said. According to the recent medical report of the Penitentiary Service Medical Department, Zeynalli suffered from chronic hepatocholecystitis, hepatomegaly, crystallization of kidney salts, osteochondrosis of the spine, radicular neuralgia, and chronic subatrophic rhinitis. Despite of the seriousness of the diagnoses, Zeynalli was not placed in the medical facility. Background: Avaz Zeynalli, was arrested on October 28, 2011 following a lawsuit brought by MP Gular Ahmadova on October 19, 2011. The Anti-Corruption Office launched a criminal case against Zeynalli under article 311.3.3 (taking a large bribe) and article 311.3.4 (extortion) of the Criminal Code. He was later charged under article 306 (contempt of court) and article 213.1 (tax evasion). On February 13th the public prosecutor asked for 11 years in prison for Avaz Zeynalli. A large number of local and international human rights organizations strongly believe that the charges against Avaz Zeynalli are trumped-up and that he was arrested for his articles criticizing high-ranking state officials.